Have you ever visited one of the United States’s 411 national parks and thought, “This experience would be more fulfilling if my view of this spectacular landscape included a logo for my favorite brand”? If so, you’re in luck! 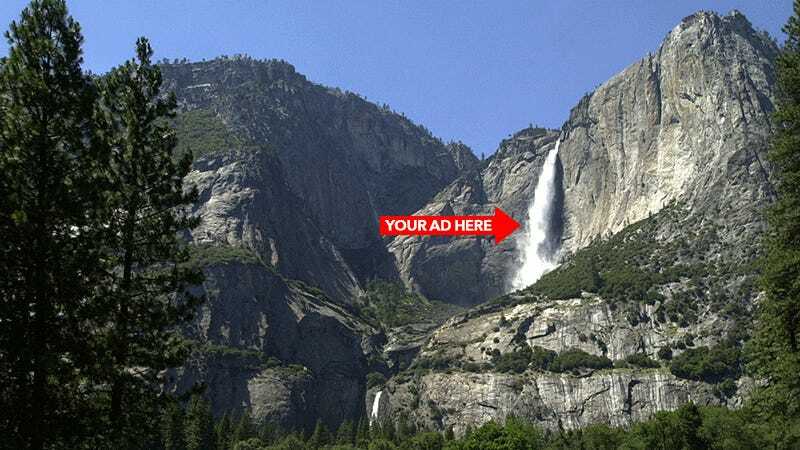 The Park Service still won’t recognize donors with advertising or marketing slogans. But for the first time, their logos will get prominent display. Companies will be able to earmark gifts for recurring park expenses, which was prohibited before. And a company in litigation with the Interior Department, the Park Service’s parent agency, could now donate as long as the dispute does not involve a national park. Though the parks “won’t recognize donors with advertising or marketing slogans,” their logos will be displayed “prominently” for the first time. Companies will be able to earmark gifts for recurring park expenses, which was prohibited before...Bricks or paving stones on the steps to a visitor center, video screens inside, educational, interpretive, research, recreation and youth programs, positions or endowments — these also will get naming rights, according to the proposed policy...And a donor will now be allowed to design and build a park building and even operate it long term. Don’t fret, Jeff! We have a few suggestions for thoughtful corporate branding.